I love tomatoes. I always have. I can remember when I was about eight and my family was living in the small town of Chipiona, Spain, my mother brought home a bunch of tomatoes. I know they weren’t ours since the patio surrounded by two-story walls that was our backyard then had no garden. I do remember that we had a strip to plant things in along the drive, but tall sunflowers grew there, while we waited patiently for the seeds to be ready to eat. Maybe a friend shared their tomatoes with her, or perhaps she thought that the outdoor market had a good price on them that day. But they must have been irresistible to her, too, because she told us that the very best way to eat tomatoes was to bite into them like one would an apple, and sprinkle on the salt. So that’s what we did, the juice running down our arms and shirts as we played outside. Who knows what the locals thought of us wandering about with tomatoes in our hands, surprised to see us eating them — not throwing them. I don’t eat them like apples any longer, of course, but when they’re especially delicious, slicing them and sprinkling on some extra virgin olive oil and salt is guaranteed — especially when I’m not in the mood or too lazy to make a salad, or a salsa. My favorite way to eat them now is cooked — either sauteed or roasted. Other than turning on the oven, or getting out a frying pan, nothing could be easier. And the flavor after such little effort is so rewarding considering the number of ways you can incorporate them into great dishes like grilled meat or pasta. Try them either of the following ways, both very, very delicious. And don’t forget to get every last drop of the pan juices onto your plate. 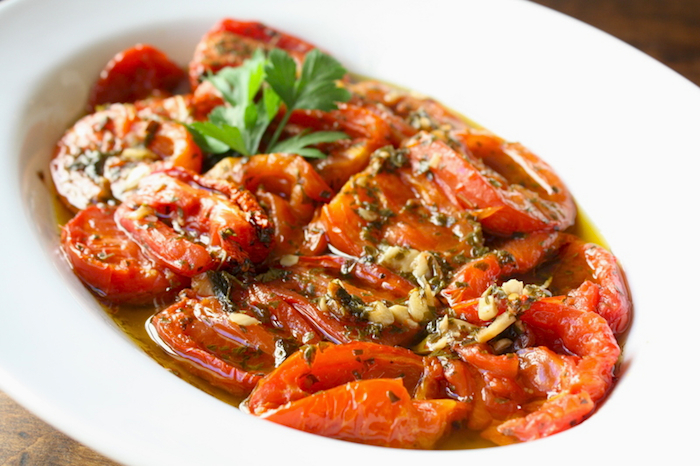 The first is very similar to the “Pomodori al Forno” published in the September ’08 issue of Bon Appetit and featured by food blogger Molly Wizenberg. The second is adapted from a recipe from the August ’08 issue La Cucina Italiana which showcased a variety of tasty tomato recipes. Honestly, I think next time, I’ll create a mix of both slicing instead of halving, with lots of garlic and shallots, with the oil somewhere in between the two. Now, if I actually remember to order San Marzano seeds to plant in pots, that will really be something. Cut the tomatoes in half and dig the seeds out with your fingers. Place the tomato halves in a shallow oven proof casserole cut sides up. 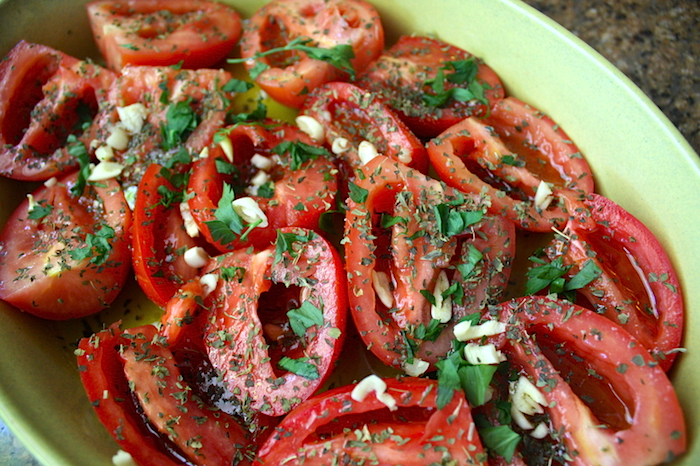 Pour olive oil over the tomatoes, making sure to cover each half. Sprinkle on the remaining ingredients, again making sure to cover each tomato half. 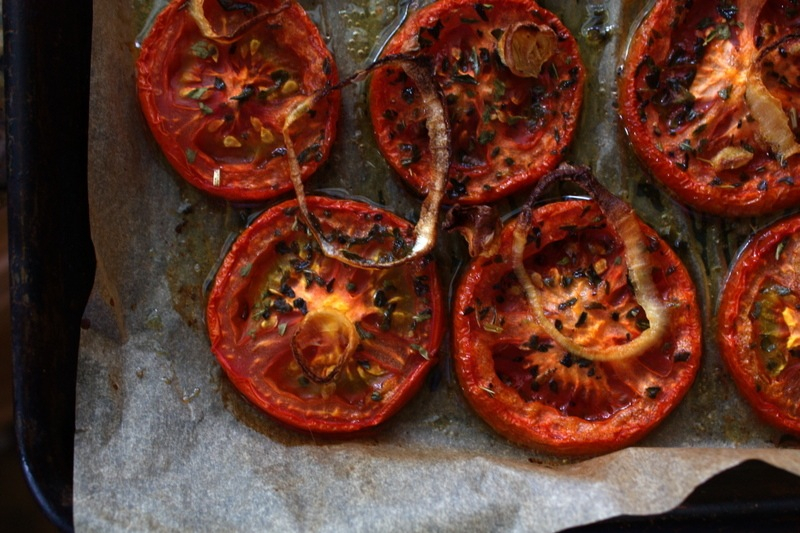 Roast the tomatoes on the center rack of the oven for 1 hour. 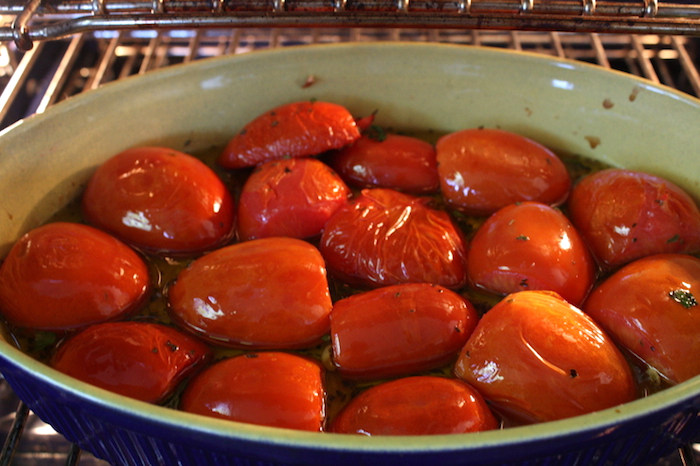 Remove tomatoes from oven and very carefully turn each tomato onto the cut side. Return to the oven and bake for 1 hour more. 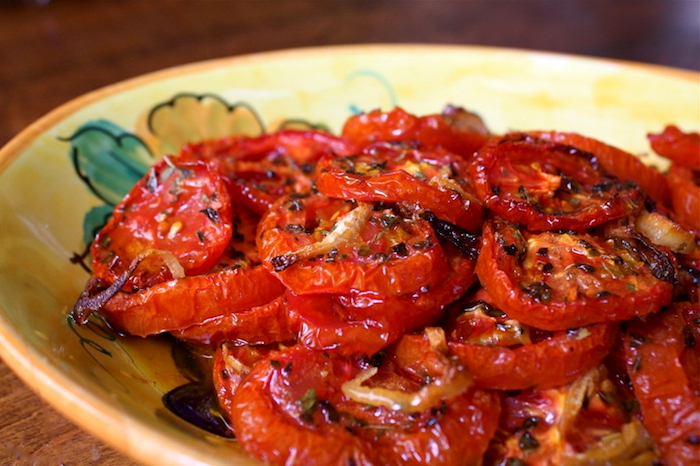 Transfer tomatoes to a platter or shallow bowl (if serving them soon) and pour over pan juices. Let sit for about 30 minutes to cool. Enjoy with bread, either by spreading and/or dipping. The original recipe linked earlier in this post called for some layering of the ingredients, and as much as 15-45 minutes more of additional roasting time depending on the ripeness of the tomatoes. I took these to a Friday get together with girlfriends where we enjoyed it with bread, a selection of cheeses, grapes, and a nice salad. Prepare a baking sheet by lining with parchment. 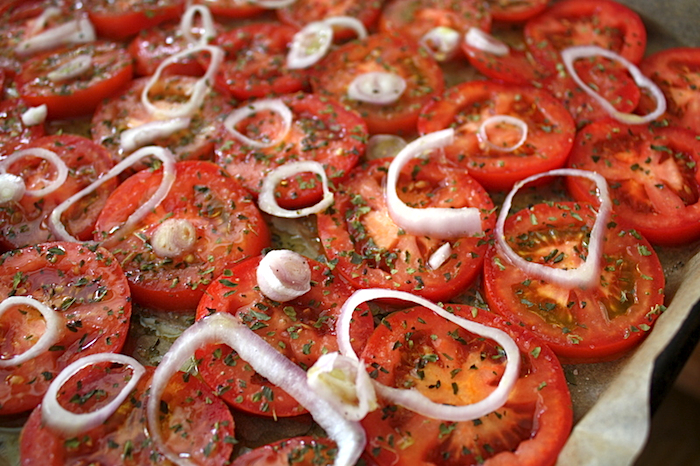 Slice each tomato into 1/4-1/2 inch slices and place on the baking sheet. Drizzle the olive oil over all, then sprinkle with oregano. Slice shallot thinly, separate rings and place over tomatoes. Sprinkle with salt and pepper. Bake for about 1 hour, or until tomatoes and shallots are very brown. 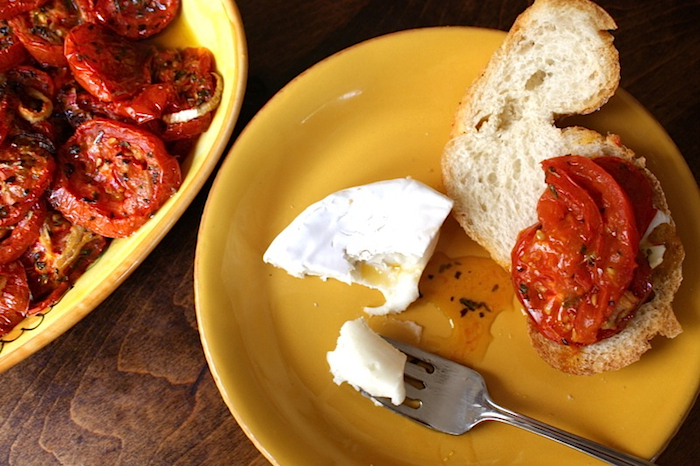 Using a small spatula, place tomato slices in a shallow bowl and pour over pan juices. Let cool to warm or room temperature. Enjoy with some bread and soft cheese. I don’t think you can go wrong with either of these methods. 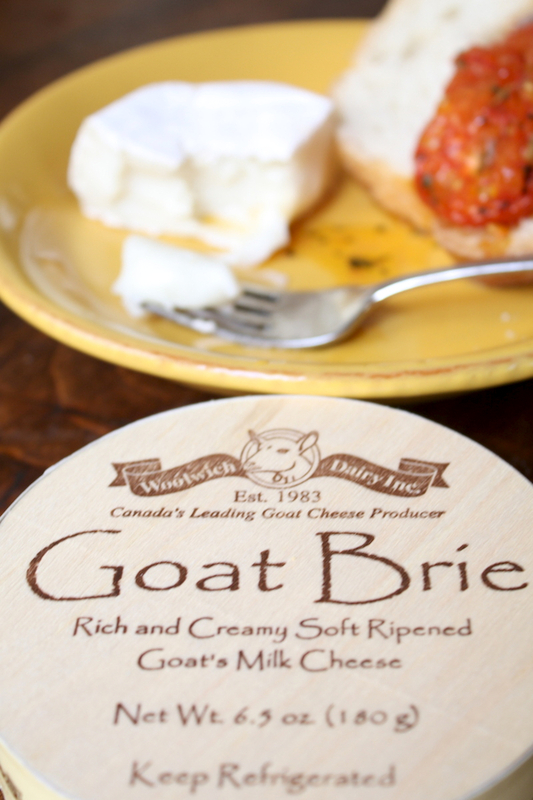 They’re both excellent with this Canadian brie that is new to me. It’s very creamy and delicious!